Yoshi and Pemba have crossed paths and are heading off in opposite directions at the moment. 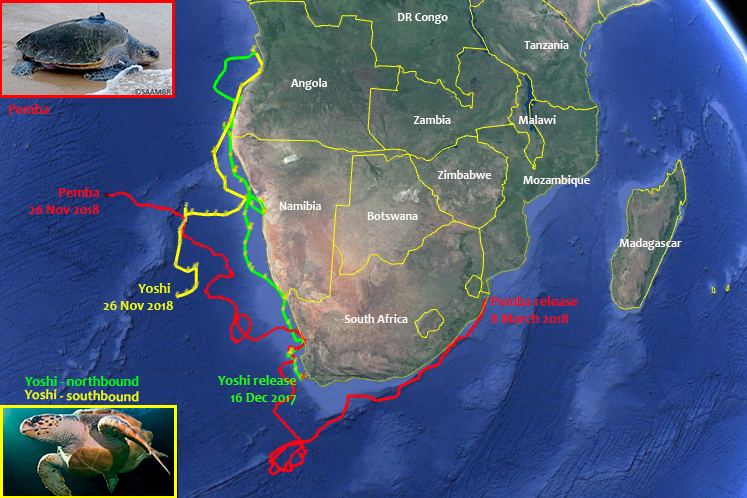 She is venturing along the Walvis ridge, and is actually 900km west of Oranjemund – so back off the South African coast! This amazing turtle has been back in the ocean for 342 days and has clocked up just over 8300 kilometers! That is an impressive 24.4km/day. She still tends to swim against currents and winds – so definitely one of the strongest turtles I have ever come across. She is moving cross current at the moment with a rather strong surface wind in 18’C water – and I am sure she is having some good snacks along the way as she is moving between some sea mounts along the Walvis ridge. Her satellite transmitter has sent us 8647 messages with 1787 satellite passes. What an incredible piece of equipment to have on her back – we have learnt so much, however, we still do not know where she is originally from. Hopefully the satellite tag will last long enough to tell us where Yoshi will go over the next couple of months. We expected her to explore the ocean for at least the first year – and then hopefully go find herself a turtle mate so that she can head back to the area where she originates from for nesting. 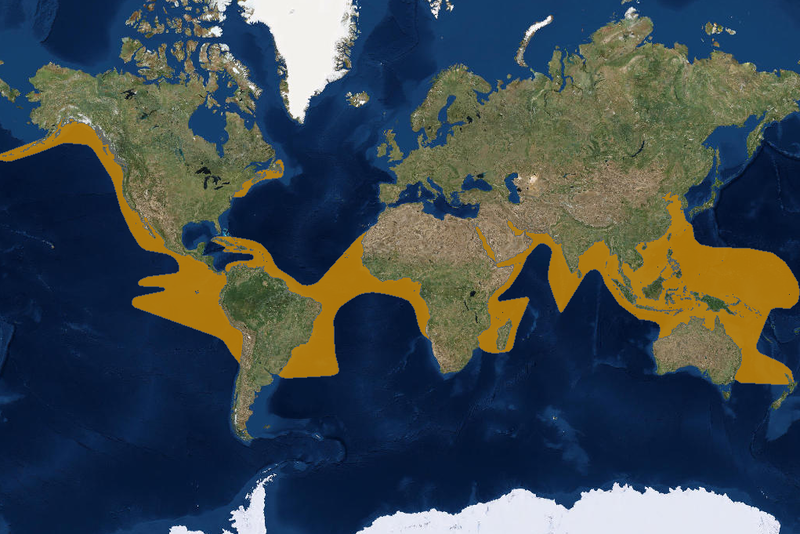 There are Loggerhead nesting sites along northern KwaZulu-Natal, Mozambique, Oman, Japan, Australia, Cape Verde, Brazil, North America (Florida) as well as in the Med (Spain, Greece, Turkey). We thought she was heading up to Cape Verde initially, but maybe she will make her back to the Cape Town and head up to Mozambique. She has crossed the Walvis ridge and is now 1000 km north-west of Yoshi. She still makes great use of the currents and has traveled 9193 kilometers since her release in March this year, with an average speed of 35.4 km/day over the 260 days back in the ocean. Pemba is an Olive Ridley turtle and there are nesting sites off Angola as well as Brazil, and she could be heading to either of these 2 actually. She is 975 km south-east of St Helena at the moment and a good 1262 km west of Cape Cross on the Namibian coast. Pemba is making good use of a strong current and the water temperature is a very acceptable 19’C. Our turtles are doing really well back in the ocean. A big thank you and appreciation to everybody who has been supporting our turtle rescue, rehabilitation and release efforts.